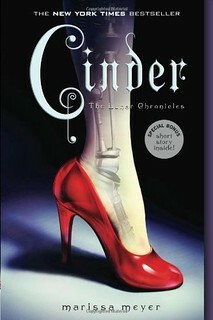 Like everybody else, I was familiar with the hype of Marissa Meyer's series The Lunar Chronicles. It seemed that any self-respecting book-lover had read the series and adored it, and couldn't stop raving about it. I didn't know what to think, but knew I should probably try the books for myself before forming an opinion. Fate stepped in and, having given my vast book wishlist to two different people, they both decided to give me this book out of all the others! If that's not telling me I NEED to read it, then I don't know what is. As I had two copies, I donated one to somebody who agreed to "buddy-read" the novel with me. Thus began my experience. The story follows Linh Cinder living in New Beijing. The futuristic world is a different place. There are cyborgs, people who have been surgically altered to have android body parts, amended nervous systems, retina displays. They are seen by society as lower-class citizens and many people fear to go near them, or let children play in their vicinity. Cinder is a mechanic with a booth in the centre of the city, earning a little money for fixing androids, "portscreens", anything technological. She has an android companion, Iko, who is a good friend. Cinder's stepmother Adri behaves awfully towards her, disgusted by her presence. Cinder also has two stepsisters. Have you figured out that we're re-telling Cinderella yet? One day Cinder has a special visitor to her booth, Prince Kai, son of the Emperor of the Commonwealth. He has an android he needs fixing, but Cinder desperately wants to hide her cyborg parts from him. On the same day, the plague is found in another booth owner, who is swiftly dispatched for "the quarantines". The plague has no cure and spreads viciously, and all people must try to avoid it. Of course, Cinder gets caught up in something bigger than herself or the Commonwealth, and finds out much about her mysterious past - she has no memory before the age of 11 when she was in an accident and had to be turned into a cyborg. It turns out I love this book! I never thought I'd dislike it, I just went in with an open mind. I was pleasantly surprised to find that Meyer's writing is compelling, and I found this novel unputdownable, which has not happened to me for a long time! I could not stop reading. I'm afraid I outpaced my buddy reader! As each new secret or gripping scene unfolded, I was dying to find out the next step of the story. I have to say that I figured out Cinder's big secret about halfway through the novel, once we were given all the strands to piece things together, but this didn't make the book boring for me. In fact, it made me read faster, anxious to find out what would happen next to reach the dramatic conclusion/explanation/revelation! This review was submitted by guest blogger Jemma.